Discover the most important landmarks of both Iceland and Greenland on the From Fire to Ice tour offered by Nordic Saga Tours. Breakfast at the hotel, then make your own way to the ferry for Pulpit Rock cruise and hike combination tour. 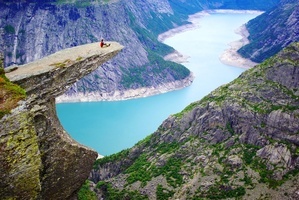 Your first stop is the famous Pulpit Rock, which towers high above the waters of the fjord. You'll hike for a few hours until you reach an incredible viewpoint, where you can gaze down at the summit below. The fjord cruise lasts about 2.5 hours and will take you to the secret hideout known as Vagabond's Cave. You'll come close enough to "The Hanging Falls" to feel the refreshing spray on your face, while Pulpit Rock towers above against a backdrop of stunning scenery. We can drop you off at Oanes village on the way back if you want to catch a bus to the Pulpit Rock trailhead (at Preikestolhytta). The hike there lasts about two hours each way. It's a relatively challenging track, probably not suitable for beginners. Don't forget to bring good hiking boots, outdoor apparel, some food and lots of water. Afterward, take the bus to the port of Tau to catch a ferry back to Stavanger. 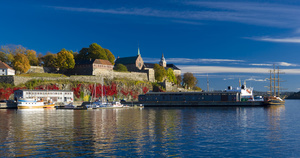 Fill up on breakfast at your hotel, then head to Oslo Central Station to take the morning train to Myrdal, on the Bergen Line. This railway is the highest-altitude railway line in Northern Europe. It has also won a spot on the list of the top 20 train rides in the world. In addition to riding high over the "mountainous rooftop" of Norway, you'll journey through quaint villages such as Geilo and Gol. Once you get to Myrdal, you'll switch trains and join the Flåm Railway, which is just across the platform. Next, you'll go on to Flamsbanen Railway. This portion of your trip showcases some of the most wild, magnificent scenery in Norway. Beautiful Flåm sits in the innermost part of the Aurlandsfjord, framed by steep mountains, rushing waterfalls, and vast valleys. You may never be closer to paradise than you are in Flåm. You'll stay there for a short time, then catch the express boat that goes from Flåm to Balestrand. Massive mountains surround you as you sail the beautiful Sognefjord. Once you get closer to the sea, the scenery opens up to reveal a wide variety of bird life. Explore the day on your own in Bergen before departing on the Coastal Voyage at 8:00 p.m. Today you'll have a chance to see all the sights that you missed yesterday - Bergen has so much to offer. The Fish and Flower market offers much more than food and flora. It's also a great place to interact with locals and take some amazing pictures. If the weather was bad yesterday, you'll have another opportunity to ride the funicular to the views atop Mt. 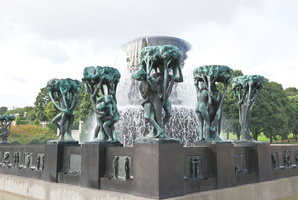 Fløien. For a truly authentic Bergen experience, you can walk back down to your hotel instead of taking the funicular. This morning, continue on the Hurtigruten ship for a full day's cruise on the gorgeous Geirangerfjord (June 1 - August 31) or Hjørundfjord (September 1 - October 31). 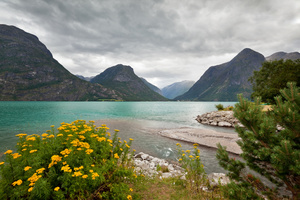 Summer travelers will sail along the Geirangerfjord, which boasts picturesque waterfalls and mountainside farms. You'll be astounded that farmers and their livestock could survive here. This place is on UNESCO's World Heritage List. Autumn travelers will enjoy a cruise on the Hjørundfjord, which is framed by the impressive Sunnmøre Alps. The Sunnmøre Alps feature rugged terrain and steep rock walls. 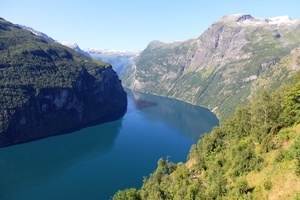 The Hjørundfjord itself is one of the oldest, most stunning fjords in all of Norway. Once you've eaten breakfast, you'll enjoy a scenic coach trip that takes you through local fjord areas, then to the village of Andalsnes. Board the Rauma Line Train here. On this portion of your adventure, you'll travel through the Rauma valley, which includes the beautiful Rauma river, picturesque bridges, and the Troll Wall mountain cliff. At Dombas mountain station, change to the main Dovre line. This will take you all the way to Oslo or Oslo Airport (depending on your departure time), through the scenic Gudbrandsdal valley. Sognefjord & Pulpit Rock Adventure was a lifetime adventure. Thank you for the perfect organization . We enjoyed it and would highly recommend it .